Prototype of a medium tank developed by Daimler-Benz from 1939 through 1941. 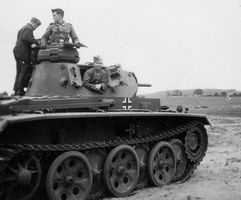 The new vehicle was to become a new standard medium tank of the Wehrmacht. The prototype was deployed on the Eastern front. Combat testing revealed a number of serious faults. In 1941, the tank was deemed obsolete, and the project was discontinued. This tank is similar to a Pz.Kpfw. III in playstyle, but more defensive. While it is considered by many to be inferior to the Pz.Kpfw. III, these players have not correctly interpreted the stats of their tanks. If one were to look deeper, they are at mostly equal, with several things stand out. Those who are familiar with it praise its survivability: its armour is bouncier when angled well, the shorter hull is a smaller target, and it has 1 degree more gun depression. However, the armour on our tank can be angled to more than 20 degrees due to the stronger 40mm side plating, and can bounce many a shot off lower tiers. Hull down is very effective due to the exceptional 'Western/American' gun depression and strong mantlet. Like the Panzer 3, you will have to keep poking in and out if a tier 5 tries to bring their gun to bear on you, but this is no different to another tier 4 such as the Covenanter. 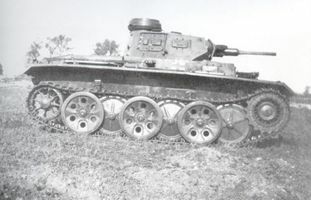 In short, the frontal armor is mostly on par and provides many more possibilities (to angle or hull down) than the Panzer 3, increasing survivability. The engine is the second most criticized aspect. 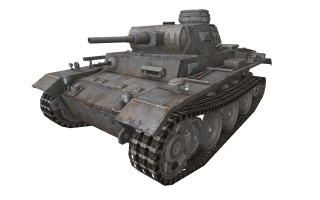 It is without the very good hp/ton ratio of the Pz 3 due to extra weight, and so inferior in acceleration. Sharp circling turns are to be avoided. However, it has equal reverse speed if it does need to retreat, and its can top speed can still be easily reached. It is more crucial to get into a position that allows for quick escapes or hard cover, such as a ridge. 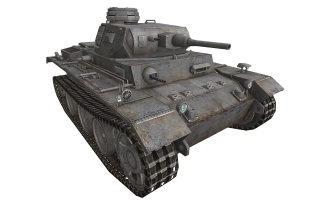 This is very similar to the Pz.Kpfw. II Ausf. G and a good preparation for later tier tanks of the VK 30D line, as these tanks have a somewhat underpowered engine but good top speed until the Leopard 1 at the highest of tiers. 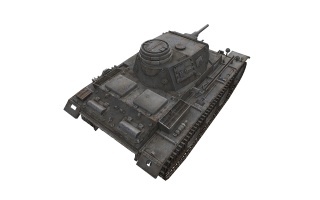 The gun selection is the same as the Pz 3, but worse than the Luchs. It is no weaker, and can be better applied over ridgelines due to the slightly better gun depression. Still, due to poor penetration, flanking or shooting weakspots is the best tactic with the guns. Still if credits are not an issue, HEAT or APCR in either of the guns will get rid of the one and only problem with the guns; lack of penetration. 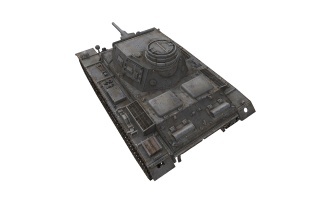 The 50mm KwK 39 L/60 has okay DPM and can make short work of any tier IV tank, especially if aimed at weaker sides or any weakspots, but regular AP struggles against heavies with less than even 70 penetration. It may be easier to pop out and aim with the 75mm KwK 37 L/24, but it is still better suited as a support gun when firing HEs to cripple enemy tanks. As usual HEAT is usually mandatory to do reliable damage, especially against equal or higher tier vehicles. All in all the tank is geared towards a more defensive and more discerning player, who can take advantage of the better gun depression and angling capability to ensure they survive first, and then use the top speed mobility to relocate, without having to brawl at close range. 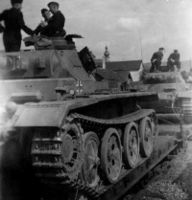 As well as this, if you are willing to forgoe the history of the Panzer, it is more forgiving as a whole. Finally, it is better preparation for the ridge-poking maneuvers, which become a cornerstone of the rest of the line, as part of the high gun depression playstyle. It is a thoroughly viable alternative to Panzer 3. This page was last modified on 6 April 2018, at 18:05.